A Portable Railcar Unloader is used to unload powdered or granulated materials from airslide railcars. 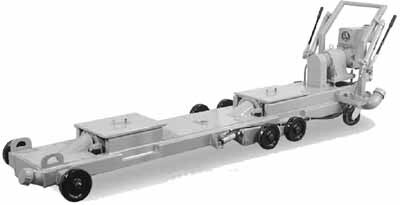 These low profile units are equipped with eight wheels to roll easily into position. Once in place, a self-contained, manual hydraulic lift allows the operator to raise the unloader to the opening of the airslide car. Four connection clamps hold the unloader securely in place to achieve a positive seal. Quick connectors are supplied for all hose connections. An internal air manifold distributes aeration air to assist in material discharge.